Water is one of the few substances that expands when it freezes. 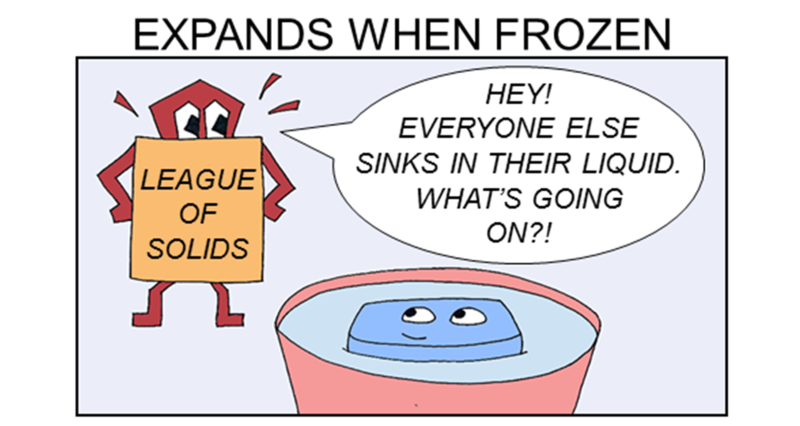 And this expansion makes ice is less dense than liquid water, which means that ice floats! This is strange behavior when compared to how most other compounds behave. If you drop a piece of solid iron into liquid or molten iron, it will sink before it melts. Same thing happens when you drop frozen oil into liquid oil: the solid sinks. Most solids are more dense than their liquids. There are a few other elements and compounds that also expand when frozen (such as silicon,bismuth, gallium, geranium, and antimony). But a lot of these elements don’t ever occur naturally in their pure forms, so for all practical intents and purposes, water is just about the only thing we deal with that expands when frozen. You can preview the accompanying guide by scrolling through the pages in the viewer below. To print your own copy, just select your preferred size of paper: 8½ × 11, 11 × 17, A3 or A4. Don’t forget to print “Actual size.” Do not print “Fit to page” or the book won’t come out right. To fold the book, either print the two-page document double sided, cut along the dotted lines, and then match the letters, or follow the instructions in this video: How to Fold A Book from One Piece of Paper. And join us next time for Science Mom’s Guide to Water, Part 5 [coming April, 2017], where we investigate why oil and water don’t mix.